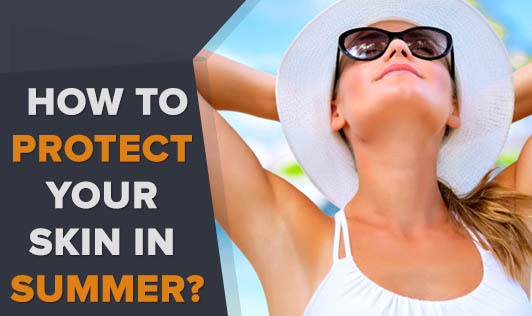 Sun burn and tan: Suntan is actually our body's defense mechanism against strong sunlight that can damage the skin. Severe sun burns can result in redness, itching and skin peeling. Using sun block lotions and calamine lotions during the day are the best way to prevent sunburns and sun tans. Acne: Heat, humidity, dead cells and oil tend to clog the pores leading to comedones (black heads) and acne. Hygiene plays a very important role in the treatment and prevention of acne. Apply a ‘mud-pack' once a week to reduce the oiliness of the skin. Drink plenty of water and include fruits and vegetables rich in antioxidants and vitamin A.
Prickly heat: Excessive sweating and dead cells on the skin cause blockage of sweat glands and can act as triggers to rashes commonly called as ‘prickly heat'. The best treatment for this is to indulge in cool showers, talcum powder and calamine lotion. Rosacea: It is identified by red inflammation of the skin on the frown areas, like the chin and cheeks. The rash can lead to tiny boils or severe acne if untreated. Using a good sunscreen and a soap- free face wash could be the best treatment. Fungal skin infections: Fungal infections are common in hot and humid weather. And, these occur in areas where there is no proper air circulation due to tight clothing and synthetic wear. People who are prone to fungal infections should take a shower frequently and use anti-fungal powder in between the skin folds. Dandruff: Over secretion of oil mixed with dead cells, sweat and pollution results in dandruff. It is not only unhygienic, but will eventually result in hair fall and pimples on forehead and back. Wash your hair often in summer and use a medicated shampoo containing ZPTO (zinc pyrithione). Simple home remedies like curd and lemon works well to reduce dandruff.